A cursor spins lazily over a primitive ocean. A button is pressed, and water is gathered in a great ball, hovering in the air. The cursor moves, the water drops, and lakes are formed. This is From Dust. 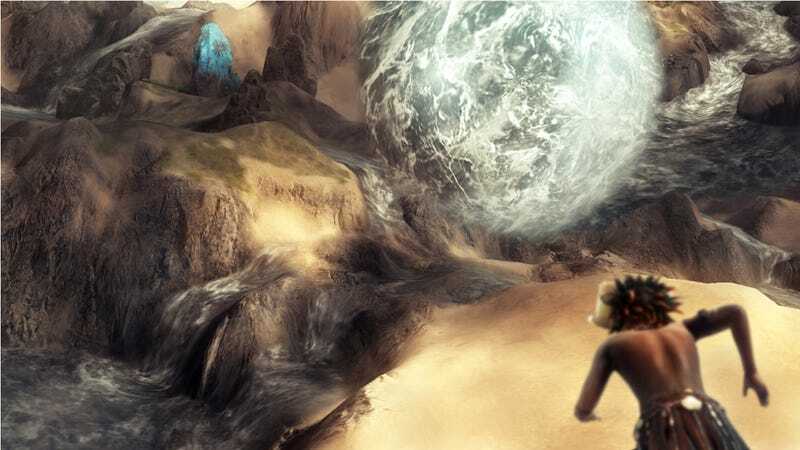 "From Dust is a god game where nature is at the center of gameplay," explains the game's creative director Eric Chahi, the mind behind Out of this World and a great admirer of volcanoes. Ubisoft producer Guillaume Brunier drives the game as Chahi explains, trying to raise his voice above the Michael Jackson dance game in the next room. "The nature is based on simulation. Every bit of land can change in real time," Chahi continues, as Brunier picks up a ball of the land surrounding a lake. The water flows beautifully over the newly created divot, forces of erosion changing the path of the dwindling stream as the water eats away at the earth. Chahi compares the basic premise of the game to a child sitting on the beach, creating a sand castle. The tide comes in and the castle gets washed partially away, as the child quickly reinforces their creation to keep damage to a minimum. Brunier picks up another ball of water with the left trigger of a Microsoft controller, moving it above the ocean, which ripples and waves in its wake. Bringing the water on land he presses the right trigger, dropping the liquid onto the land, forming two lakes. The physics at work are incredibly impressive, especially considering this is a downloadable game for Xbox Live Arcade, the PlayStation Network, and PC. Water ebbs and flows, erosion slowly wears down the land. Brunier picks up some molten lava in a ball, dropping it on the ground where it cools, forming a rocky outcropping. He then picks up a ball of plant-covered land, dropping it on a stretch of desert. Trees quickly grow. "This world is an amplified version," says Chahi. "It's moving stronger and faster." Which makes it tough for the dark-skinned, tribal-mask wearing natives who populate the islands of From Dust. When you aren't busy playing god with the landscape, your goal in the game is to help these natives survive destruction by nature's hand. A shaman from the tribe in the demo predicts a tsunami is coming, telling the player to bring back the power of water to the village in order to save it. The power of water is an ancient stone atop a cliff, and one villager must be called to it to earn the power needed to say their people from destruction. The villager's path is part red, and part green. Green means the way is clear. It's up to you to make the path completely green. Brunier takes a large chunk of land out of the villager's path, and the camera switches to a view behind the villager, a giant ball of earth hanging in the air behind her. It's an amazing sight. The villager makes it to the ancient stone and absorbs the power. Guilliame drops water on her don the way back, forcing her to be washed down stream towards the village, leaving her panting and breathless on the shore. She makes her way to the village center, sharing her power. A timer in the bottom corner of the screen ticks down to the tsunami. When it arrives, the villagers raise their voices in song. "The song is their magic," says Chahi. "It's the vibration of the air pushing back the wave." The wave subsides and the villagers are safe. For your trouble, you gain the power to freeze water in a jelly-like state, removing large chunks in order to create traps or structures that eventually revert to their liquid state. The demo begins winding down. Brunier drops some lava on some vegetation, creating a fire. Then he drops water on it to put the fire out. It's so simply, yet it's obvious complex computations are going on behind the scenes. Would the demo have continued, so would the cycle of disasters. The tsunami might return, with new powers and understanding giving the player new ways to combat it. The overall goal is to build multiple villages. Once you have the required amount, your villagers will perform a migration ritual, moving on to the next area. But who needs goals when you have power? As we leave, Chahi and Brunier show us one more thing: The World Editor. A giant circle appears on the screen, and the entire area rises upwards, water sluicing from the sides. A giant mountain of water rises, and then collapses, flooding the land. It's all dynamic. It's all real-time. The potential of the game has me completely giddy. I could spend hours simply playing with the land, ignoring my villagers' pleas, or I could help several generations of my people flourish. I just hope Chahi and Brunier don't make us wait too long. We're ready to play ball.